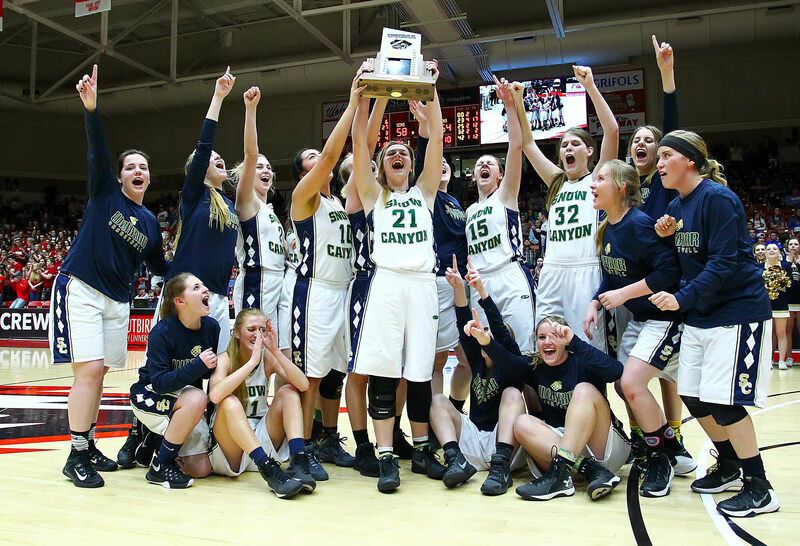 The Utah State 3A Girls Basketball Tournament brackets have been filled. Last year, Region 9 was well represented with three of the final four teams coming from southern Utah. Carbon crashed the party last year after Desert Hills lost in the first round. This year looks like the semifinals may be more diversely represented. While all four Region 9 playoff teams are in the top 12, there are three or four other teams all capable of winning the entire tournament. Stansbury gets a rematch against the team that knocked them out of the tournament last year. The only problem is that Carbon is even better this year. They tied for first in Region 12, but lost the coin flip to Richfield. They have won five in a row entering the tournament, including a win over Richfield. They are the only non-Region 9 team to make the semifinals last year. The Thunder got the toughest draw for a top seed. Desert Hills got the toughest play-in game against the Riverhawks. The likely quarterfinal matchup will be against No. 3-ranked Carbon. For Ridgeline, Crosbie and Wright are both all-region transfers from Mountain Crest. But the Thunder are ranked No. 1 for a reason. They have the deepest roster in the whole tournament. Nine players play significant minutes. BYU bound Beckstrand has been playing her best ball the last few weeks. Two weeks ago, it looked like the reigning state champion Warriors would be left out of this year’s tournament. But with a little luck (coin flip) some help and a key win to end the season, Coach Dan Roden’s team gets the chance to defend its championship. The play-in game is against Juan Diego however, who beat the Warriors by 21 points on Dec. 1. Snow Canyon has gotten better, though, and they are healthy. It won’t be a 21-point loss this time, but the Soaring Eagle have to be the favorites. This is the only play-in game where the home team is the underdog. Juab is the third seed, but sat behind Richfield and Carbon in arguably the toughest region in 3A. Their four losses against the field have come to those two teams as well. Coach Elison came oh-so-close last year. Though they lost some key pieces to graduation and transfer last year, the Reds still pose a prominent presence in this year’s tournament. They are one of a handful of teams that could win the entire tournament. If Logan wins, they will not have far to travel for the tournament being held at Utah State this year. Tooele made the tournament because all Region 10 teams make the tournament. The Wildcats got a good draw against the worst offensive team to make the tournament. Interestingly, their opposing offensive and defensive averages match. Richfield should not have any problem with the Lady Buffaloes. Grantsville ended the year winning their last 10 games and sweeping Region 10. That streak began with a 40-point win over the Hawks in the Hodson Classic. North Sanpete, on the other hand, has only won two of their last 14, both against Canyon View, the only team from Region 12 to not make the playoffs. Don’t expect a different result in the rematch. Hurricane had to do something it had failed twice before this season to make the playoffs. Beat Pine View. After losing the coin flip to Snow Canyon, the Panthers and Tigers played a third time to fill the final slot for the 3A playoffs. Now the Tigers get a tough Morgan squad. Both teams are offensive-minded and the score for both could hit 50-plus. Morgan has been here before, though, and this is the first trip for any player on Hurricane’s team. Advantage to the Lady Trojans.